The Wolves should run this play more often. The other night against the Lakers, the Wolves second string improvised with the shot clock dwindling down, and showed off a basic NBA set that most teams would run regularly with this set of players. Shabazz Muhammad had the ball on the right wing without much happening with the offense. 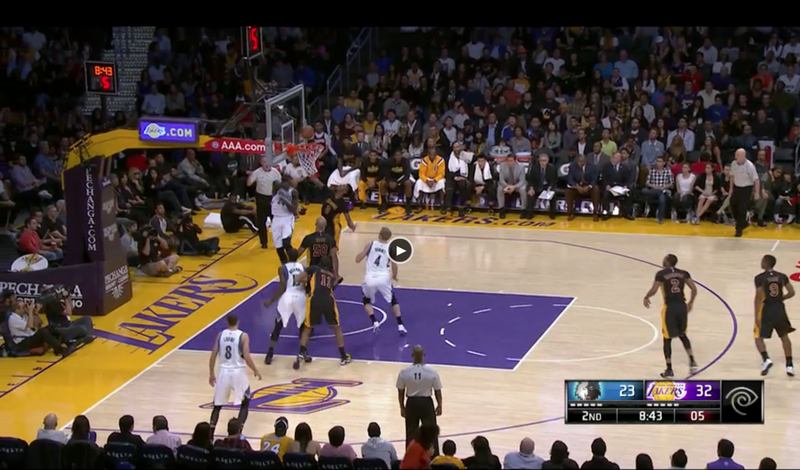 Anthony Bennett was set on the opposite block, and saw Shabazz left out on his own. He ran up to set a ball screen for his teammate. 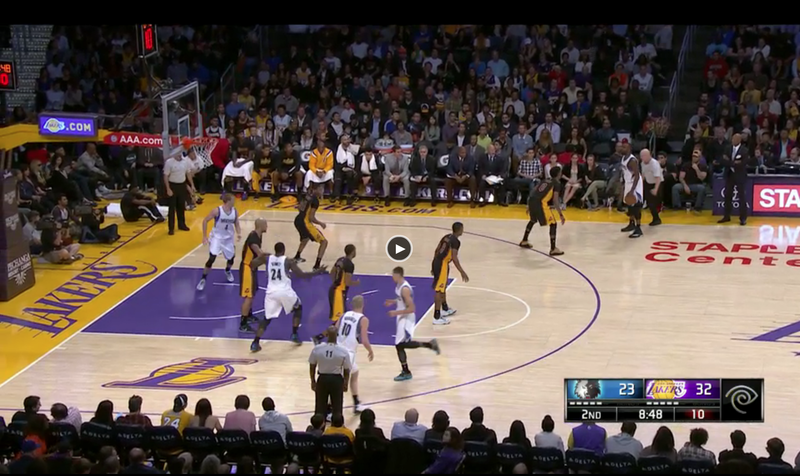 While this ball screen was being set, Robbie Hummel and Zach LaVine got out the way. The wide-shouldered Bennett set an effective screen on Nick Young, and Shabazz — with his strong left hand — drove hard into the lane, drawing attention from Robert Sacre, the screener’s defender. Young was left trailing the action and in need of help. 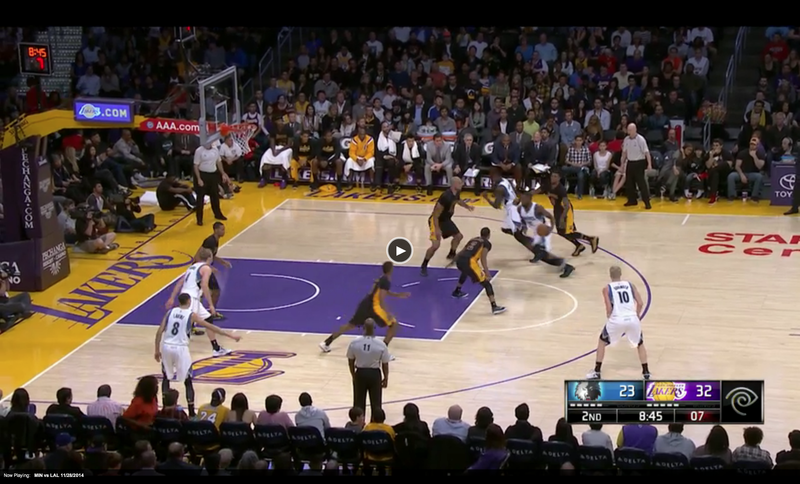 Wes Johnson did not help enough off of Robbie Hummel, and Shabazz and Bennett had a 2-on-1 situation right by the hoop. 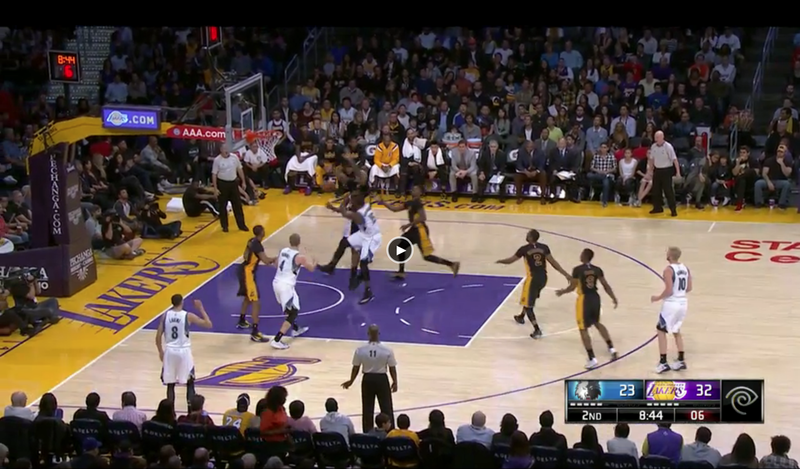 Bazz dropped off the dime around Sacre, leaving Bennett open for a layup. Young was too late in catching up to the action, and he fouled Bennett as he laid it in for two points and a chance at a third. This is incredibly simple, easy-to-repeat basketball that a young team like the Timberwolves could run all night long. Preferably, Ricky Rubio would be the playmaker for most pick-and-rolls. That can happen when he gets back. But Shabazz could also develop nicely if he could attack the heart of defenses from the right wing, much like other lefty wings like Ginobili and Harden. As defenses adjust, it will — at worst — lead to a simple drive-and-kick pass to the left wing, and better ball movement. As things are, the Wolves waste too many possessions without some of their more passive players (Wiggins and Bennett) even touching the ball. Instead, Mo Williams and Thad Young dominate it, en route to difficult and contested shots of their own. Here’s hoping to see more pick and rolls like this one. The Mayo Clinic sponsors Wolves/Lynx basketball. Also has sports medicine in the old E Block downtown Minneapolis. Would have been good public relations if Kevin Martin’s wrist surgery was done in Rochester, MN rather than at the Cleveland Clinic. Both are exceptional medical facilities, but Mayo Clinic deserves max return on its investment. Went to the T-Wolves-Blazers game last night and I was really struck by how Portland spread the floor especially compared to the Wolves. And it led to a lot of open threes, which is also a function of the Wolves poor defense, but it left me frustrated with the Wolves offense more than anything. I was also a little confused by some of the lineups Flip put out there, but I’m not an expert on what works in what situations and considering all the injuries, it’s tough to find a good mix. Would’ve liked to see more of Bennett, but man I want him to start driving hard to the hoop sometimes instead of shooting that long two every time. Lavine looked as lost last night as he looked good on Friday night, but that’s to be expected from someone so young and raw. I think Mo is going to drive me nuts before this season is over, but he ended up with a nice line. Budinger was just awful. I thought he was supposed to be shooter. Wiggins had that one drive and layup that really showed how athletic and talented he is. And Bazz was extremely fun to watch in person. He just never stops moving and fighting.